Schaffenburg e.V. – We won a Scope – Wir haben ein Oszilloskop gewonnenSchaffenburg e.V. 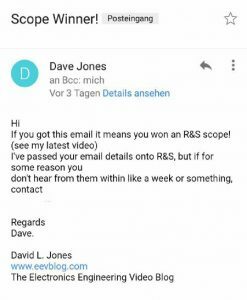 A bit over one and a half months ago, Dave Jones from the EEVBlog and the german test equipment manufacturer Rohde und Schwarz announced a contest: Get a high end oscilloscope if you convince us you need it with a video. 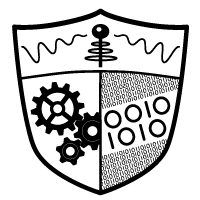 I saw the announcment and immediately scrambled to make a video showing our hackerspace, walk-trough style. A TFT scope would save a lot of bench space compared to our old crt boat anchors, wouldn‘t it? I posted the video to youtube and a link as fast as possible in the forum [ENTER LINK HERE]. Some days later, Dave announced the winner [ENTER LINk]. Unfortunately we didn‘t even make it into his top ten. Slightly disappointed, I wrote it off as a failure. At least there have been some viewers that know Schaffenburg now. 3 Days ago, Dave uploaded a new video named “more scope winners” [LINK HERE]. I didn´t bother to watch the video, because I thought it was about a new contest I didn´t enter. Mail from the man himself, announcing that we won on a second draw. First I thought it was a fake or something. So i watched the latest video and there was the proof: My face on the screen. Rohde und Schwarz surprisingly picked us as third winner, we will get another great scope! Now we are waiting for them to contact us. Ich sah das Video und machte schnell ein kurzes Tour-Video durch unseren Hackerspace. Ich postete das Video so schnell wie möglich im Forum und hoffte auf das Beste. Ein TFT-Modell würde gegenüber unseren Oldtimern mit Bildröhre sicher einiges an wertvollem Platz auf dem Labortisch sparen! Ein paar Tage später gab Dave den Gewinner bekannt. Leider schafften wir es nicht mal in seine Top Ten. Die Enttäuschung und das Gewinnspiel waren schnell vergessen. Wenigstens erhielt das Video und damit der Space ein wenig Aufmerksamkeit. Ich habe das Video zunächst gar nicht angeschaut, da ich davon ausging das es sich um ein anderes Gewinnspiel handle, an welchem ich garnicht teilgenommen hatte. Mail von dem Herrn höchstpersönlich! Zuerst dachte ich an einen fake, habe dann aber das Video angesehen. Und tatsächlich, da war es zu sehen, mein Gesicht. Rohde und Schwarz haben tatsächlich uns als dritten Gewinner, für ein etwas geringer ausgerüstetes Oszilloskop, ausgewählt! Nun warten wir darauf, das Rohde und Schwarz sich bei uns meldet.